Don’t be fooled by the size of the jug. 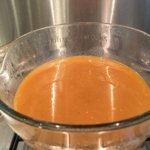 Gravy making is something of a mystery and it’s easy to buy supermarket ‘fresh’ gravy or resort to something from a packet or jar. Over the years I’ve tried some supermarket ‘fresh’ gravies only to be left disappointed so one year I took the plunge and made my own. I like to make this head of Christmas and freeze it ready for the big day. *This recipe can also be adapted to make poultry or a meat gravy by changing a few ingredients. ***this is not 90 day SSS plan friendly, it’s gravy! Take a sturdy roasting tin, something with deep sides. Roughly chop your celery, carrots and onion leaving the skins on the onion and arrange them in the bottom of your roasting tin. Sprinkle the dried sage over the vegetables and add the bay leaves, peppercorns and garlic cloves (with their skins on). Take the chicken wings and cut them into pieces buy cutting through the natural joint and arrange them on top of the vegetables. Dot the butter on top of the turkey drumstick and place this to the centre of your roasting tin. Cover the vegetables and poultry pieces with the olive oil and put the tray in the oven. Bake for approximately 45 minutes before checking. 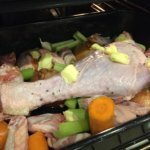 If you’re happy that the turkey drumstick is almost cooked and the vegetables are softened, cook for a final 10 minutes then remove from the oven and transfer the roasting tin to your hob. Add 50ml of boiling water to your dried mushrooms and set aside for later. Place your roasting try on your hob across 2 burners if possible and turn them on at a low heat. Also at this stage you can remove the turkey drumstick as it’s done it’s job! You will need to hold the roasting tray as you work it so be sure to have an oven mitt or gauntlet so as not to burn yourself. As your pan starts bubbling away on the hob add your mushrooms that have been steeped in boiling water including the water as this holds lots of flavour. Holding the roasting tin give the pan contents a good stir, firstly to incorporate the mushrooms but also to loosen those lovely crusty pockets of flavour that are stuck to the pan. Now add the wine to the pan and turn the heat up a little as you’re looking to cook off the alcohol. While that’s happening, take a potato masher and start to mash your ingredients. This is going to help release more flavours from all the vegetables and the chicken wings and you’re slowly building up the layers of flavour of your gravy. Just take a couple of minutes to do this as the alcohol from the wine continues to cook off. Next add the tomato puree to the pan and give it a good stir to incorporate it and also cook it. There’s nothing worse than coming across a lump of tomato puree so give it a good mix as it’s going to add to the flavour of the gravy. Turn the heat down and start to add the flour a tablespoon at a time. Sprinkle the flour on the pan ingredients and start to mix it in to create your roux (a roux is used to thicken sauces, made from fat and flour). Don’t worry about lumps at this stage, by the time you’ve finished adding all the flour you’ll have mixed it in so well that there won’t be any lumps other than the veggies and chicken wings! Take a couple of minutes to incorporate the flour into the other ingredients as well as cooking out the flour. Once the flour is worked in add the next tablespoon and repeat until all the flour has been added and well incorporated. As each tablespoon of flour is added you’ll notice that the veggies are going to start to thicken as you stir so keep stirring! Now it’s time to add your boiling water. It’s just plain old boiled water. No extra stock cubes, flavourings, just water. Pour it in carefully and gently start to stir the water to start creating your gravy. Don’t be too worried, it’s going to be a watery mixture with lots of floaty bits. Once you’ve given it a good mix you don’t need to stand over it and stir. Bring it to a simmer and check it after 10 or so minutes. Give it a stir and you’ll notice that as the water evaporates it will start to thicken. Let it simmer again for another 10 minutes and check it again. Give another stir and make sure that nothing is sticking to the bottom. If you’re happy with the thickness of the gravy move on to the next stage, but if you like a thicker gravy leave if for another 10 minutes. Take a teaspoon and have a taste of your gravy to check the seasoning and add salt to taste. Also add a teaspoon of cranberry sauce to the gravy as it lifts the flavour, just like when you add dark chocolate to a chilli (if you’ve not tried it, all you do is add a couple of squares of 70% dark chocolate and see the magic happen before your very eyes!!). Give the gravy a good mix to incorporate any salt you’ve added and the cranberry sauce and taste it one final time to make sure you’re happy with it. For this next step you’re going to need a sieve over a large bowl, a ladle and another bowl for your leftover stock bits. Start to ladle the gravy into the seive and use the ladle to press the juices out of the mixture. When you can see that there is no more juice or liquid coming from the sieve add more mixture and start pressing again. When the sieve is full of bits empty them into another bowl and keep sieving the mixture until you’ve used it all up. 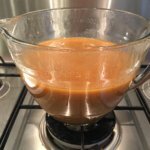 When I made my gravy I had 1.5 litres of gravy at the end of it. I left it to cool before putting it into a container and freezing it. I’ll take this out of the freezer on Christmas Eve and I’ll use it on Christmas Day. Merry Christmas and I hope you enjoy your gravy! Here’s to a leaner 2018! If you don’t have any white wine open, port will work just as well. 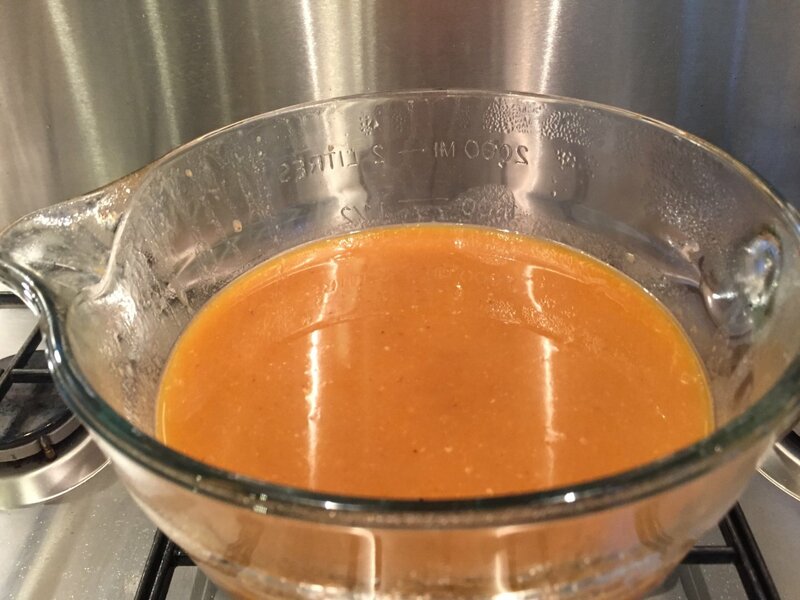 Remember to cool your gravy before freezing, and if you are left with any fat at the top of the gravy you can remove this with a spoon before freezing! First published on 17th December 2016, updated on 12th December 2017.